We published our Two-day Guide to Lisbon, Portugal earlier this week. At $503 roundtrip from Boston, this might be your chance to go see for yourself! If you've had a trip to Europe on your wishlist, now's the time to book it for later this year. We've been watching the airline prices from some of the big trans-Atlantic markets in the United States, and are feeling quite good about the fares available right now. The specifics are going to be a bit different from one person to the next based on your airline preferences, origin and destination, and time constraints around work and life, but the bottom line is that we think now is the time to pull in a good deal (some even in the sub-$500 round trip range, flying economy class, of course). If you're holding Chase Ultimate Rewards points associated with your Sapphire Reserve credit card, of course, you get 1.5x redemption value meaning that you can book a $500 roundtrip ticket through the Chase Ultimate Rewards travel portal for a paltry 33,333 points; that's (33,333pts x 1.5) / 100 = $499.99 ticket. Likewise, if you are using Citi ThankYou points associated with your Citi Prestige card, you can book through Citi to get that $500 ticket for 40,000 points. Anyone using the American Express Business Platinum card will get (at the end of the day once credits are applied) the same deal as folks with the Chase Sapphire Reserve, though sadly the regular American Express Platinum (i.e. non-Business) will demand the full 50,000 points for the transaction. ...but don't get me wrong, paying cash for a roundtrip to Europe in the $400 - $600 band is still a great deal. 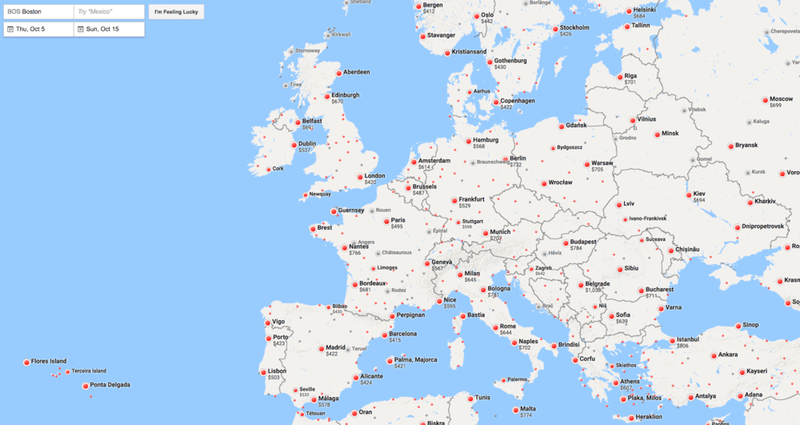 I've run the maps below in Google Flights, for flights originating from New York (typically the best trans-Atlantic deals originate here), Boston, Washington, Chicago, and Los Angeles. For sake of an apples to apples comparison, I've run them all to depart on Thursday 5 October, and return on Sunday 15 October. This allows those in the United States whose employers do consider Columbus Day a holiday (by no means everyone) to spend 9-10 days in Europe and only take five days off from work. That said, similar prices are getable on any number of city and date combinations, so explore the map a bit. If you don't live in one of the air markets I've suggested, consider booking a separate ticket to get to the departure city with a better rate; this will often work out in your favor, particularly in and out of Boston or New York where jetBlue has a big presence, or Chicago or Baltimore-Washington (BWI) where Southwest has a big presence. Of course, we have some ideas as to what you might do with yourself when you arrive. We hope you'll take some inspiration from several recent notions from the Wine:Thirty Flight archive:. Choose between the world class wine of the Douro River in the north, the splendor of Lisbon further south, and everything in between. My recent trip to Sweden was brief, so we're going back in May, and will have far more to share when we return! Happy booking, and happy travels!